Every now and again I see a headline that makes us cringe here at Arc-Zone: Tulsa Business Evacuated in Welding Tank Fire, Man Critically Burned after welding too close to combustibles, Welding Sparks Trailer Fire…. brutal, frightening reminders that welding can be dangerous. Remember, welding can be safe as well, if you take precautions. Some of the obvious include welding far from combustibles, and making sure all your equipment is in good working order (checking fittings for gas leaks, for example). There’s also personal welding safety. Most of us know to wear proper apparel, from leather garments, welding gloves, to flame retardant cotton welding sleeves and jackets that protect us from the errant spark and UV light. Even for a quick weld, you still need to suit up. Arc-Zone carries respiratory welding safety equipment Miller’s light-weight, high-efficiency PAPR (Powered Air Purifying Respirator) that integrate with Miller welding helmets for ultimate welding safety. 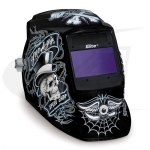 And speaking of welding helmets and welding safety… we’re always a bit astounded when we see fabricators on t.v. doing a quick weld, and rather than put on a welding helmet, simply turning their head for a moment. Always protect your eyes! Did you know there are approximately 10,000 eye injuries related to a lack of welding safety each year?? Here’s a technical article we put together on selecting a welding helmet, including the pros and cons of autodarkening vs. “flip up” helmets, and choosing the correct filter shade for your welding safety (pdf). And when you’re ready for a helmet, Arc-Zone.com carries top of the line welding helmets from Miller and Jackson, leaders in welding safety. Common eye injuries include damage from flying particles, chemical burns or irritation, and radiation burns from UV light (corneal flash). Eye damage can occur even if you’re not staring directly into the light. For more information about keeping your eyes safe when welding, and what to do if something goes wrong, we’ve prepared Eye Care for Welders (.pdf). While we here at Arc-Zone, located just a few miles from the beach, we may experience near perfect climate year round, in many parts of the country (not to mention the rest of the world) summers mean heat and heat stress can be a safety concern for welders. One of the most innovative welding safety products to enter the marketplace are the CoolBand and CoolBelt systems from Miller designed to reduce heat stress and improve welder comfort. Last summer we posted a great list of safety tips for welding in the heat over on CarmenElectrode.com.